*I received free ARCs of Captivate Me and IRIS from Xpresso Booktours in exchange of an honest review. “My mom had always told me – when you meet “the one”, you’ll know; they’ll captivate your heart the moment you lay eyes on them. I had always wondered, though, if my mom’s words of wisdom were finite – if they applied to everyone. Maybe those who had found their one great love were the lucky few, and maybe the rest of us would have to settle for less than earth-shattering.”Seventeen-year-old Kat Walsh is a Gifted – a human with paranormal abilities. With her mom a former Angel and her dad a dream prophet, it’s always been in her genetic make-up to be extraordinary. But, unfortunately for her, the world can’t handle the strange or unusual. So when she slips up and uses her powers at her high school in Ireland, the entire student body treats her like a freak – even the ones she thought were her closest friends. ***This book is meant to be read after Captivate Me***Set before the events in Book One of the Captivated Series, “Iris” explores the depths of family bonds, new bonds, and the lengths a person would go to save the life of a dying sibling. In this novella, get to know Iris and her two sisters more intimately, as well as Gabriel, the first angel-human hybrid who agrees to live under her protection. 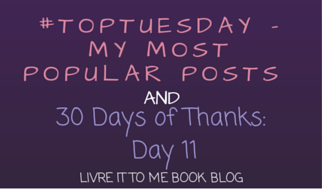 Welcome to my stop on the Captivate Me/IRIS Blog Tour! Below is my review of the first book with a teaser about the next AND a giveaway! Click on the image at the bottom of the screen for the rafflecopter! I really enjoyed reading the various characters in Captivate Me and then learning more about some of them in IRIS. Kat is a well-created character who has quite a bit of learning and growing up to do. This obviously sets the stage for some pretty interesting things to happen. Kat is just learning to be herself after hiding her Gift for so long. She’s quickly sought after by a very nice and popular guy named Levi. I also like Kat’s roommate Anna; she and Kat are a perfect pair. There is also a mess of other characters who I deeply enjoy, Gabriel, Iris, and a few others.. but you’ll have to read to learn more. Pierce does a good job creating her characters and giving them enough backstory to move the story along, but leaving enough up in the air for the reader to want to learn more. The dialogue in Captivate Me is realistic and fitting for the Young Adult reader. There is nothing overly stand-out, but it does help move the story along. I like the internal monologue, as well. I found the dialogue in IRIS to be a lot more fun. Perhaps this is because of the characters and personalities of those involved in this particular novella. This was a fresh take on the typical paranormal young adult books that are floating around. I haven’t seen this story before, which is part of the reason I found it so much more enjoyable. All of the characters have their own sub-story, which enables a novella like IRIS to work so well. There are some really great visual moments, such as those in the woods, but I felt this story could have used more in the visuals. This would have helped drive the story farther. I wanted to “see” more colors and patterns. This is not a complaint, just a suggestion, however. I definitely enjoyed the ending of this book. There was a lot to be said, but it was done in a wonderful way. Captivate Me ended wonderfully, opening the door to Book 2, and IRIS introduced what will be happening in 2, but should be read AFTER Captivate Me. I am a big fan of YA Paranormal books and this one was done very well. Definitely worth a shot. 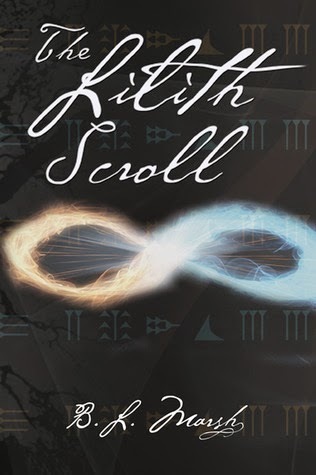 *I received a free ARC of The Lilith Scroll from N K Author Services in exchange of an honest review. Please see this post for the book spotlight and more information on where you can find it! I found the characters in The Lilith Scroll to be incredibly complex and well-developed. Marsh does an incredible job weaving character webs and she hooked me very quickly. Lilith St. Claire is our main focus and I found myself wanting to join her in her adventure to find out about her past. Oh, and Sam… I’ll just leave it at that. Part of what drew me in to each of the characters is that there was a reason they became how they did and Marsh placed motivation into each of their actions, regardless of how small. There were moments in The Lilith Scroll where I fell completely in love with a character because of their various monologues and speech patterns. Marsh creates a beautiful dialogue, especially between Sam and Lilith. There’s a moment toward the end where I had to re-read just so I could live the moment again. The dialogue is realistic and appropriate for the time at which it takes place. The dialogue and the plot work hand-in-hand to create a wonderful story. I was unsure, at first, how I would feel about this story. As a personal preference, I don’t usually gravitate to stories that appear to be about religion, but this was such a wonderfully different story than what I expected. It was a bit slow to start and slightly confusing as I adjusted to Marsh’s style, but once I did, I fell right in line and enjoyed the adventure. I loved that I understood the shorter Hebrew phrases. Marsh did a fantastic job weaving her educational studies into this impressive novel. There were many times during The Lilith Scroll where I felt like I was right there, experiencing the sights, smells, and feelings. Moments in the Garden had me reliving my own studies when I was younger. Marsh describes everything as I pictured them, but so much better. I wanted a little bit more, but considering the rest of the novel was at such great length with such hefty detail, the ending was a bit of a relief as it closed the loop. I look forward to seeing where Marsh takes this story and what is to come. There’s something different about this story from anything else I’ve read. If you enjoy reading Tolkien, this is a great option for you. *I received a free ARC of Crystal Magic from Xpresso Booktours in exchange of an honest review. 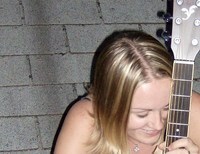 Nothing is safe around Kristyl Barnette. Windows break. Books rocket across the room. Lights flicker. Strange occurrences follow the sixteen-year-old everywhere. When tragedy forces her to move to the small town of Clearwater, Michigan, with her estranged aunt Jodi, Kristyl tries to leave her past behind. But Clearwater has secrets of its own—a mystical history that intersects with Kristyl’s life and might shed light on the inexplicable events that plague her. When a mysterious illness threatens her aunt’s life, Kristyl will do anything to cure her. Enlisting the help of witches could save Jodi, but is dealing in magic worth the consequences? The characters in Crystal Magic are very lovable. Kristyl (Krissa) is really genuine and I found myself wanting to reach through the pages to hug her at times and others I wanted to high-five her for just being awesome. She’s genuinely curious and resilient. She’s had a lot to adjust to, as we find out at the beginning of the book, but that’s only the beginning for her. I enjoyed following her through her journey and finding out how she adapted to each curveball thrown at her. Krissa’s aunt, Jodi, is endearing and caring; it’s apparent early on that there’s something about her we don’t know. Another wonderful character is Owen – ugh, love him. I did find myself wanting to know more about him. Luckily, this is a series, so I may get my wish. One character I couldn’t stand is Crystal. (Imagine having to share your name with someone who is just an all-around bully.) She is developed well and has a nice bite to her. The dialogue in Crystal Magic is realistic and fits the Young Adult genre well. I enjoyed the back and forth between Owen and Krissa. There was something refreshing about finding dialogue that can read aloud and on the page easily. The arguments aren’t forced and the monologues aren’t heavy. This is a fun story with some nice twists. Between finding out the backstory of our main character and sifting through the crazy in the town of Clearwater, I was pulled right into the story. I look forward to seeing where this all goes in future books. There are some really good moments throughout the book. As this wasn’t a visual-heavy story, I found myself drawn to Jodi’s store, Hannah’s Herbs. I could see the stones and jewelry. Having been in places like this before, I could practically smell the incense burning. I also enjoyed “seeing” the town of Clearwater and adventuring through Krissa’s new home. 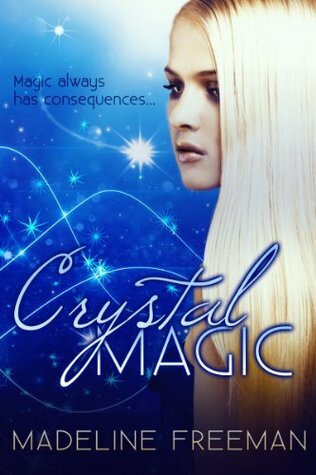 If you enjoy Young Adult Paranormal books, Crystal Magic is a pretty great choice for you. This may be my powers of seeing the future kicking in, but I have a feeling that this is a series to keep an eye on. I look forward to finding out what happens next. 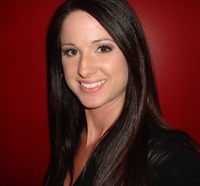 Madeline Freeman lives in the metro-Detroit area with her husband, her daughter, and her cats. In the time she should spend doing housework, she rewatches Fringe. She also loves anything to do with astronomy, outer space, plate tectonics, and dinosaurs, and secretly hopes her daughter will become an astronomer or a paleontologist. Follow this link to get to a Rafflecopter giveaway!!!! Celina Bayberry is your run-of-the-mill teenager – angsty, stubborn, insecure, and awkward. She’s uncomfortable in her own skin, works part-time at the wildlife reserve near her home, and meets Aaron, an attractive and strange guy who seems to turn up around every corner. Overnight, things start happening to her that she can’t explain. She quickly learns that there’s something bigger going on. Overall, I found this Young Adult book to be a fun read. It is fast-paced and age-appropriate. Something that really pulled me in was the amazing cover design! Kudos to Steven Novak! Celina (Lina, for short) is decently written, though I found her character lacked substance. Her stubborn, man-bashing ways became repetitive, though I did like her growth from the beginning of the novel to the end. I would have liked to see her a little more developed, though I anticipate that when a sequel does come out, there will be more elaboration on her. I found Aaron, Lina’s coworker in the shelter, to be amusing, confident, imperfect, and loyal. He adds a nice opposition to Lina, giving a bit of variety to her surface personality. The “bad guys” are really well created. They have the right bit of ooze and ick, balanced with a hint of slickness. I also love Celina’s cats – Chubby, Harry, Snowella and Albert. I’m a sucker for anything paranormal that relates to vampires, shifters or witches. In this case, there’s the shifter element. 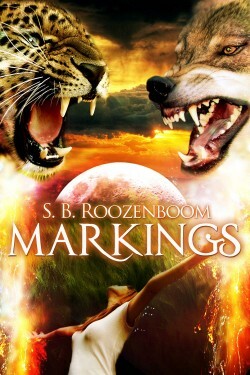 I think that Roozenboom built this story off a great idea and there’s quite a bit of intrigue around the unknown. If I could choose any animal to shift into, I’d probably find myself turning into a cat of some sort. Description is definitely Roozenboom’s strong suit. Set in Oregon’s Wildcat Country, there were high expectations for imagery and they were lived up to. Between the images of animals at the shelter, clothing choices of the characters (who doesn’t love a little sparkle?) and other descriptions that help drive the plot along – Markings paints a really great picture of the world Celina Bayberry is living in. It definitely helps that the cover is so striking! I wanted more from the ending. There was a great build-up to the final scene, but I felt there could have been more. It felt abrupt and rushed. Despite this, I can’t wait until the next book in this series comes out. This is a story I latched onto and I can’t wait to see what happens next! If you like YA paranormal romance, this is your book. Between the great imagery and the fun plot, this is a quick read. There’s a character in this story for everyone, so give it a chance! Format of Book: E-Book, One day I will own her paperbacks, too. She’s just that good. I will start by saying I read this book in one day.. I really couldn’t put it down. From The Wreckage is a beautifully written novel that will draw you in from the very first chapter. When you start reading, you really don’t know what you’re getting yourself into and then suddenly you are thrown onto a rollercoaster ride. From The Wreckage is a haunting story about Jules Blacklin, a high school senior, who has survived a devastating storm in her town. She is forced to keep moving forward and find a way to continue surviving, despite the horror that she has experienced firsthand. Have you ever read one of those books where you feel like you are right in the middle of all the action? I was terrified, anxious, attached, frantic, desperate, hesitant, and filled with hope at multiple points while reading this novel, many at the same time. If you are like me and have never lived through a natural disaster to this magnitude, it’s hard to know what it’d be like. Sure, you can imagine it to some degree, but you really don’t know. From the moment the tornado lands, I was right there with/as Jules. My heart was racing and I felt her desperation. Miller does a great job delving into the psyche of a victim, finding the different facets of what makes her characters tick and then taking them through various stages of disarray. Each character experiences the same horrific and traumatizing event, but they all come out with a different scar. The sad beauty is that not all of these scars are physical. I immediately felt drawn to Jules. She’s that girl who has it all and then… doesn’t. Her decisions are many of the same ones I’d make. She’s one of the most real characters I’ve had the pleasure of reading in a long time. One heartbreaking character within this story is Jules’ younger brother, Jase. Children see the world with open, excited eyes; they are ready to explore and learn. What happens to children when their world gets turned upside down, literally and figuratively? Perhaps the biggest character of all is the storm itself. It becomes more than an event, it becomes personified – a villain that came to town and changed everything, leaving dust, damage and loss in its wake. Storms like the one in FTW happen all the time around the world. You watch the news, see photos and videos, feel sad and slightly scared, but it’s still not typically on your doorstep. Unless you’ve lived through it firsthand, there’s no way to actually get it. Reading From The Wreckage made me feel like I was inside the storm instead of just seeing archived footage. Recovering from those early scenes was like finishing a race… you need time to let everything settle and go back to normal. When I’m reading a really good book, I find myself seeing through the eyes of a character I am drawn toward. For this one – it was Jules. The tornado touched down right behind her and my world went hazy as I ran for my life. When you find yourself right there, in the midst of it all, that’s when you know the author did something right. Without giving anything away, the ending was satisfying enough, but I wanted even more. Not in a bad way, but in the when’s-the-next-in-the-series-coming-out kind of way. But that’s how it goes with books I am drawn into. Looking forward to the next one!! Beauty and tragedy don’t tend to go hand-in-hand… but here they do. So much loss, love, growth, and coming of age in this complex YA novel. It’s a great start to what is sure to be an amazing series. I am an avid Michele G. Miller fan, but this is by far her best yet. 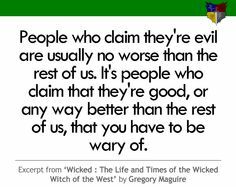 Wicked: The Life and Times of the Wicked Witch of the West is a clever take on L. Frank Baum’s The Wizard of Oz. The reader gets to see the story from the Wicked Witch’s point of view. From start to finish, we learn more about the Witch, her roots, her life story, her struggles and joys. Is it possible to love a villain? Hey, is she even really a villain? That’s what this beautifully written novel does. I absolutely love Wicked. This was my third time reading this book; each time I read it, I find at least one detail I missed from before. I enjoy reading books that give me a different perspective each time I read them. This is no different. Separated into five parts, this novel is incredible from start to finish. There are two sides to every story and Maguire gives us a compelling and rather artistically-worded version. Dare I say, I enjoy the story within this novel far more than I enjoy that of the musical of the same name that was based off of this book. I love the darkness and the beauty of each character. The character development of Elphaba, our main character, is laid out to the very last detail from start to finish. Maguire takes us through the various stages of Elphaba’s life- from a little baby with terrifyingly sharp teeth, through teenage years and adulthood, until she meets Dorothy Gale. The thing that makes this book most enjoyable is how Maguire makes Elphaba into a character that the reader can relate to. I find it most interesting that it makes sense. This could be how the Wicked Witch was before that fateful meeting with the girl in the blue checkered dress and annoying little dog. Throughout Elphaba’s story, we meet quite a few intriguing and mysterious characters; the beautiful Galinda with her upper-class life, Boq with his endearing persistance, Fiyero with his otherworldy ways, the Wizard with his agenda, and so many others. I fear giving too many names, as I don’t want to ruin the story for anyone. The dialogue in Wicked matches the wide array of characters that Maguire has introduced the reader to. The philosophical banter, moral questioning, heated arguments, and quirky jokes help drive the plot and characters along nicely. There are many times in Wicked that I found myself thinking, “Huh, I never thought about it that way” for various points characters would bring up. The argument of “What is evil?” comes up very often, each character sharing their perspectives. This book has it all – mystery, intrigue, tension, love and hate, life and death, darkness and light. There’s a lot going on, but Maguire shares this with the reader in such a way as to not become overwhelming. I enjoyed finding out where Elphaba came from, who her parents were, what it was like to grow up in her world, follow her through her time in school and see what was to become of her. Maguire raises questions of morality and religion and what the consequences of our actions are. The best part of Wicked‘s plot is that there are no stereotypical plot devices used. This is a freshly told story that keeps the reader on their toes wondering what will happen next. The imagery in this story is well done. Maguire gives the reader enough detail to have a foundation but not so much that there is no need for imagination on the reader’s part. It’s amazing how Maguire can take a story like The Wizard of Oz that is so iconic and have his own take on what the land of Oz is like. He has an almost Tim Burton-esque view of this world he has adopted and made his own. After 406 pages, I still didn’t want it to end. Luckily, it doesn’t have to just yet. 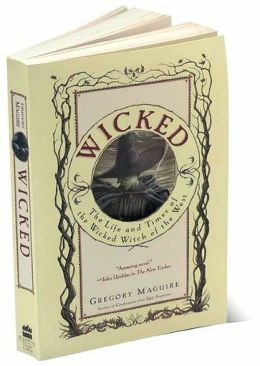 Gregory Maguire has created a lovely little series of books to follow Wicked. While you know the ending of The Wizard of Oz, the ending of Wicked is like a whole new story. That’s all I will say about it. Other than, I love it. There’s a reason that I keep coming back to this book. It’s cumbersome in a wonderful way. I enjoy this version far more than The Wizard of Oz, but then again I’ve never been one for campy stories. There’s a little something in this story that I believe everyone can relate to, though the darkness interwoven throughout may not be for everyone. I love a book that can make you think. Give it a shot and keep an open mind.